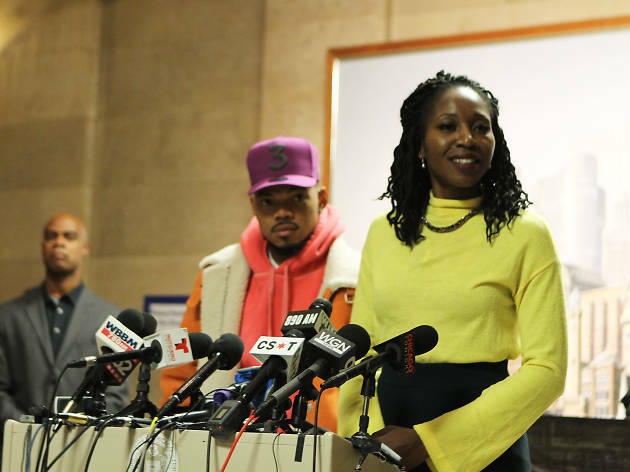 “I'm proud to announce that I will not be running for mayor,” Chance the Rapper stated at the top of a press conference in City Hall, which he announced via his Twitter account yesterday. Instead of throwing his “3” hat into the ever-expanding crop of Chicago mayoral candidates seeking to replace Mayor Rahm Emanuel when he steps down in 2019, Chance decided to use his platform to endorse a candidate he admires. “I'd like to say, very narcissistically: If I back you, you have a chance,” he noted. This morning, Chance formally endorsed Amara Enyia, a Garfield Park resident who is currently the director of the Austin Chamber of Commerce and is making her second bid for mayor (she dropped out of the 2015 race to endorse Bob Fioretti). Enyia grew up in the south suburbs of Chicago, earned a PhD in Education Policy from the University of Illinois at Urbana-Champaign and is a well-known Chicago activist and organizer. “I believe that me and Amara share a vision of what Chicago could be,” Chance said, highlighting her experience as an activist and her commitment to helping the economically downtrodden. Chance also addressed his father—and former aide to Rahm Emanuel—Ken Bennett's support of mayoral contender Toni Preckwinkle, saying that he loves his father but doesn't share his vision of Chicago's future.